What is arthroscopic surgery for shoulder instability? 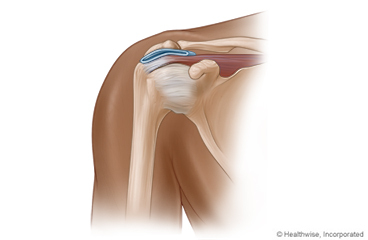 Arthroscopic surgery for shoulder instability repairs a shoulder that is unstable and slips in and out of its socket. This can cause pain. It can also limit how well you can move your shoulder. To do the surgery, the doctor puts a lighted tube through small cuts (incisions) in your shoulder. The tube is called an arthroscope or scope. Next, the doctor puts some surgical tools in the scope to help make needed repairs. Then he or she stitches the incisions closed. You will have scars, but they usually fade with time. Most people go home the same day of the surgery. You will wear a sling for a few weeks. You may be able to do easy daily activities in 2 to 3 weeks. Just don't use your affected arm. Most people who work at desk jobs can go back to work at this time. But if you lift, push, or pull at work, you will probably need 3 to 4 months off. Most people can start to do activities that have a low risk of shoulder injury in about 3 months. Jogging is one example. If you play sports, training may also start at this time. Most baseball or softball players can start to toss a ball lightly. But it may take 6 to 12 months to return to normal throwing. How long it takes depends on how damaged your shoulder was. It also depends on how well your rehabilitation (rehab) program goes. Enter B569 in the search box to learn more about "Arthroscopic Surgery for Shoulder Instability: Before Your Surgery".